1995 was my breakout year for horror movies. I was eleven/twelve years old and my dad had already introduced me to Halloween and he wasn’t restricting the films that I rented anymore. If it looked scary, I rented it, and Village of the Damned was one of those films. At the time, I had no idea who John Carpenter was, nor that he was the same man who directed Halloween, but I was sold on Village of the Damned thanks to Christopher Reeve and cool box art. Village of the Damned is rather tame and feels very much like one of those early-to-mid 90’s horror films with a side of John Carpenter styling/music. I rented Village of the Damned and taped it onto another VHS tape which my brother I watched dozens of times from 1996-1998. By then, I was done with Village of the Damned and had moved onto to other newer films. I actually forgot Village of the Damned existed until a couple years ago when I ran across the title and I put it on my list of films to revisit. After a lucky thrift store find, I came home with Village of the Damned and popped it in to see how it held up. Everything alive in a small town passes out for a few hours. Nine months later, several women in the town gave birth to children who look similar and seem to share a collective mind. -Village of the Damned doesn’t feel like a typical John Carpenter movie, but every once in a while it dips into that “John Carpenter world” and I love that. The music also goes from boring but serviceable into badass John Carpenter synth in a matter of moments. -I admittedly haven’t seen a lot of Christopher Reeve films outside of the Superman movies, but man was he a talented actor. His performance far and away is above everyone else and he really grounds the picture and makes it tragic. -The children walk a fine line between creepy, haunting, and so annoying you want to strangle. Kudos to the child actors/actresses and the direction they were giving. Watching them march around 2x2 is a very frightening sight. -Although there is not much gore in this film, the few times we do see something unsettling it’s well done. -Growing up I was a big Kristie Alley fan, but while watching this film I felt like they could have casted the role better. Her performance left a lot to be desired and it felt like she was there to pick up a paycheck. She really phoned in her performance. -It’s hard to categorize this film as a horror film, because it plays out more like a supernatural drama with a couple of horror moments. Then there is an element of science fiction in it, so it’s really impossible to truly place this film into a genre. It also makes watching it a bit strange, because you never know exactly what you are supposed to take from the film. -When the John Carpenter moments show up (parts of the score, certain cuts, and the horror elements) the film really works, the rest of the time it’s really hit and miss. It feels like a film that John Carpenter made, but the studio got involved with, brought in a different director and then edited themselves. -It’s hard for me to watch this film and not think of the wonderful Twilight Zone episode, “It’s a Good Life.” Sadly, “It’s a Good Life” is a better story and I think the run time helps. 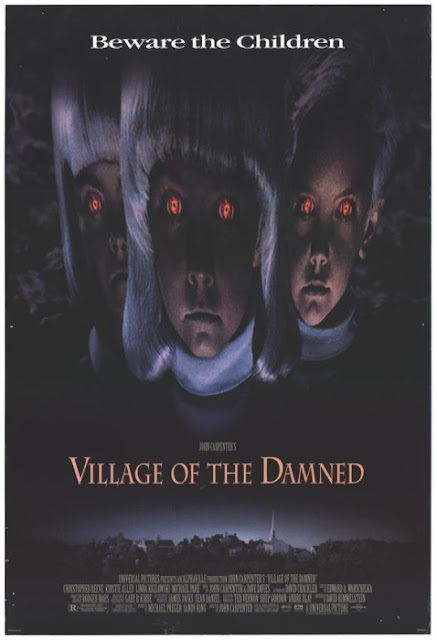 Village of the Damned would be a great entry in a one hour horror anthology series, but I don’t think there is enough substance to truly justify a feature length run-time. -The film was shot in Marin County, California where John Carpenter owned a home. The locals were not happy with the filming and attempted to break into equipment trucks. One person would even crank a chainsaw or turn on a lawn mower during a sound take, and wouldn’t turn it off until he was paid. -Christopher Reeve’s final feature film before becoming paralyzed. -John Carpenter filmed Village of the Damned as part of a contractual assignment and it was not a project he was passionate about. I think this is why the film barely resembles a John Carpenter film. -Wolf Rilla, the director of the original Village of the Damned visited the set with his wife. -The poor box office return on Village of the Damned killed The Creature of the Black Lagoon remake John Carpenter was working on with Universal. Rewatching Village of the Damned was an entertaining nostalgic trip for me, but I feel like this was one of those movies that was better left in the past. Had you asked me to review it based off what I remembered, I would have easily said it was four out of five, but having re-watched it, I'm hard pressed to say it's better than two out of five. I suggest you skip Village of the Damned unless you are a John Carpenter completionist.